Try our free online chakra analysis here! A component of the Bioptron light therapy device also works on the more subtle body, especially the color therapy set. Thus we can view the difference in someone's aura after they have had a treatment. The patient places their hand on a hand-pad which reads off very subtle electrical impulses from their skin. It then sends these impulses to a computer program which interprets them and generates a visual image of the person's aura. 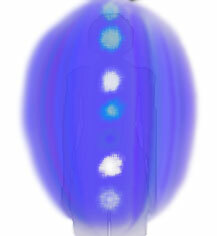 This is a person's aura with their seven chakras visible. There is also the option to have their face in the picture. It shows some of the many layers of the aura, as well as whether the patient's system is toxic, and possible energetic blockages and problems in the body. Also the location of specific colours, for example whether they are on the left or the right side of the aura, or at which chakra they are located, will mean different things. The explanation for all of this is included in the 5 page printed report which the patient can take with them. An example of a difference after a treatment would be that if someone was treated with a moderate amount of one colour, their aura would show that colour after the treatment. The colors and their locations can also show some of the patient's personality traits and possible obstacles in life, and also how to overcome them. Another important aspect of the subtle body is the quantity of energy at each of the chakras. That quantity of energy directly relates to the meridians running from or through that chakra as well as the organs in the vicinity of that energy center. We can also treat lacks of energy in specific chakras by boosting the chakra's energy with its native colour. In this graph a change is noticeable after a Bioptron treatment. 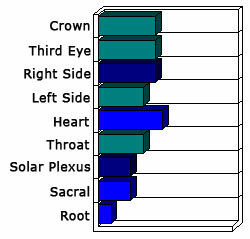 Even after a general light treatment, the levels of energy in the chakras will rise slightly. Over time if the treatments are continued the body can create reserves of energy and become more efficient at its everyday tasks. This graph represents the quantity of energy contained in each of the two sides of the aura. One side receives energy from the environment and events of an individual's day, and the other projects energy to others in the vicinity. If these sides are out of balance, it can lead to quite complex problems. A Bioptron treatment has a noticeable effect on the graph, especially with clients whose energy is drained. The energy levels may rise or drop, depending on the requirements of the body. The three divisions of this pie chart represent the mind, the body and the spirit. The body is the physical entity, the mind the cognitive entity and the spirit the emotive entity. The size of the division represents the amount of usage of the entity, and will vary accordingly. The aura fluctuates constantly to adjust to its environment, and no-one will have a static image, rather a dynamic field of fluctuating energy around them. There will be some colours that are present most of the time, and these are considered their overall colours. We view the patient's aura in real-time on a computer screen. All logos, trademarks, graphics and text in this site are property of their respective owner. Custom graphics and text © 2004 by Light & Colour For Health & Beauty under the 1994 copyright act.